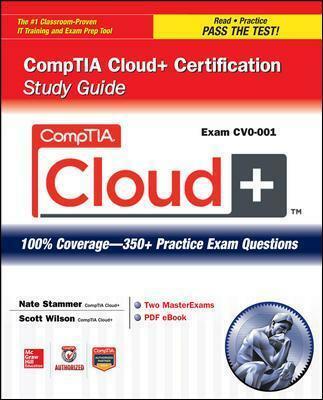 The best fully integrated study system available for the CompTIA Cloud+ Certification examWith hundreds of practice questions, CompTIA Cloud+ Certification Study Guide covers what you need to know-and shows you how to prepare-for this challenging exam. McGraw-Hill Professional is a Gold-Level CompTIA Authorized Partner offering Authorized CompTIA Approved Quality Content to give you the competitive edge on exam day. Nate Stammer (Omaha, Nebraska) has worked in the IT industry for more than 15 years in various administrative roles, earning his first certification in Windows NT 4.0. For the past two years he has worked as a technical trainer at 1staff Training and is responsible for training on various Microsoft technologies. Stammer is also co-owner of Courseware Experts, which develops and writes courseware, articles, and videos for a variety of large organizations. Stammer holds various certifications from both Microsoft and CompTIA including CompTIA A+, CompTIA Cloud Essentials, Microsoft Certified Trainer, MCSE Private Cloud, MCSA Windows Server 2012, and MCSA Windows 7. Scott Wilson (Omaha, Nebraska) manages, consults, and trains IT organizations on how to better deliver value to their customers. Wilson has 16 years of experience in IT leadership across multiple industries and in companies ranging in size from SBE to Fortune 500. He has successfully delivered IT solutions and provided leadership on a global scale, with particular focus on the Latin and South American regions. With Stammer, Wilson is co-owner of Courseware Experts. He currently holds several certifications on Microsoft technologies and ITIL capabilities, including Microsoft Certified Trainer, MCSE Private Cloud, MCITP Enterprise Administrator on Server 2008, and MCITP Enterprise Administrator on Exchange 2010.